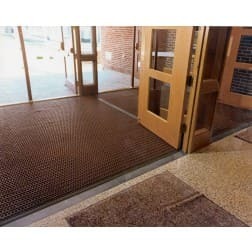 Recessed Grates - Recessed Floor Mats | Mats Inc.
Mats Inc. supplies recessed grates, foyer mats, and carpet tiles that effectively remove dirt, mud, water & more to keep your entry clean and lower costs of maintenance on your facility. Recessed grates are ideal for high traffic areas including office buildings, school, airports, and hospitals. In addition, we supply carpet titles designed to trap dirt and remove grime from shoes in indoor and outdoor areas. Made of extruded 6063 aluminum alloy and are fabricated to exact dimensions to insure fit to the mat. 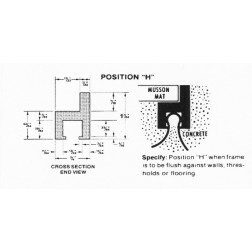 Frames are supplied with mitered corners and shipped unassembled with all necessary anchor keys and corner pins. Frames must be assembled at the job site and installed so that upper edge is level with finished floor surface. The frame should be anchored into cement with anchor keys a minimum of 24" on centers. Corner pins should be installed at all corners of frame. "Dimensions" are inside frame dimensions. This is a unique floor covering in tile and strip form manufactured from recycled strips of industrial tire carcasses. 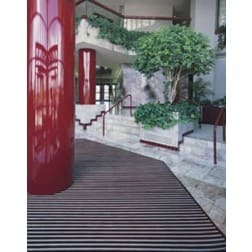 The walking surface of the strips is chenille and vulcanized to a flexible backing. It is tough, non-absorbing, high wear flooring for use indoor or outdoor, in public buildings, schools, ramps, locker rooms, or entrances. May be vacuumed. Use mild detergent and stiff brush to clean heavily soiled areas. Use our environmentally friendly adhesive to bond tiles to floor. Adhesive covers approximately 100 square feet per gallon. Here is the first shoe and boot cleaning fiber known to man. 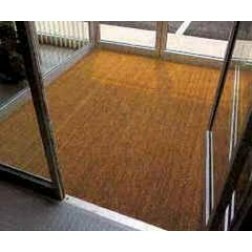 3/16" thick vinyl backing completely protects floors with no leak-through as with woven brush mats. These mats are easily cleaned by shaking, vacuuming or rinsing. Available in rolls and are ideal for vestibules and recessed applications. Maximum size available is 78 3/4" wide x 41' long. Cushion tile is the functional solution to the elimination of fatigue, vibration and slipping. 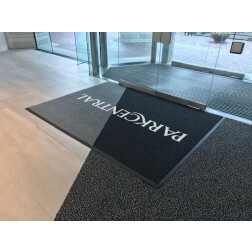 The mat is made of durable vinyl plastic and is easy to install and custom cut to fit. Made from 100% recycled PVC material. Black or yellow ramped edges are available with the same interlocking mechanism. Can be used in industrial plants, machine shops, exercise rooms, health clubs, swimming pools, hot tubs, saunas and in boats. See #0616S for solid version or #0616G for grit top version. 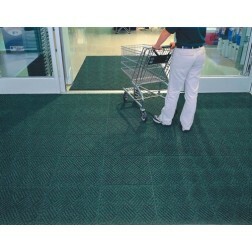 24 ounce per square yard anti-static 100% premium polypropylene fiber system dries quickly and won’t fade or rot. 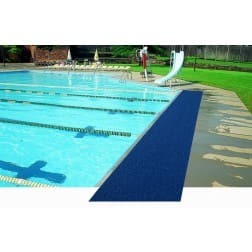 When wet, the rubber-reinforced surface allows water to be wicked to the bottom of the mat, below foot traffic and providing a slip-resistant surface. Unique ridged construction effectively stores dirt and moisture beneath shoe level. Damaged or worn tiles can be replaced easily. Install with solvent-free permanent adhesive. Exclusive rubber reinforced face nubs prevent pile from crushing in high traffic areas, thereby maintaining high performance and extending product life. Should not be in areas exposed to animal fats (kitchens) or petroleum products. Easy to clean: Just vacuum. An upright carpet extractor may also be used with permanent adhesives. Available in either 1/4" or 7/16" thickness. Tile size: 18” x 18”. Unique ridged rubber reinforced design traps dirt and wicks moisture beneath the shoe level so that it is not tracked into your facility. Exclusive rubber-reinforced face nubs extend the performance life by maintaining the bi-level construction in the pattern. The anti-static 100% premium polypropylene fiber system will dry quickly, and will not fade or rot. The perfect dirt stopper for outside and recessed applications. 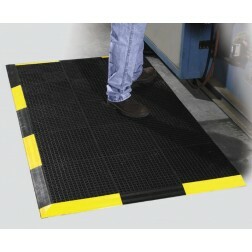 This durable, vinyl loop mat, stands up to heavy traffic and scrapes dirt and grime off shoes. This mat is unbacked to allow dirt and moisture to drain through for easy cleanup.